"The future of music is in the minds of young people: the same young people that YPCF musicians inspire through their workshops and concerts." 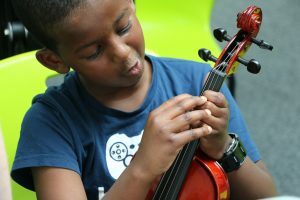 Somers Town Sinfonia (STS) and Haverstock Hill Sinfonia creates a new orchestra for 8-year olds from Camden Primary Schools, working alongside YPCF professional tutor-musicians. This year Somers Town Sinfonia is funded by Youth Music and Haverstock Hill Sinfonia by the Mayor’s Music Award. STS and HHS meet after school each week for 11 weeks in the Summer Term 2017, providing a bridge to new learning, new musical skills and new ensemble experiences, culminating in concert performances. YPCF Sinfonias project is led by animateur and musical director Becky Chalmers, Ian Dean is producing the project for YPCF, creating content and putting together a team of tutors, musicians, arrangers and pastoral care, in collaboration with Camden Music Service. YPCF Sinfonias weekly ensemble rehearsals offer an opportunity for children to extend instrumental learning with professional musicians playing alongside them, through extended specialist instrumental skills, notation skills, sectional rehearsals and large ensemble performance. 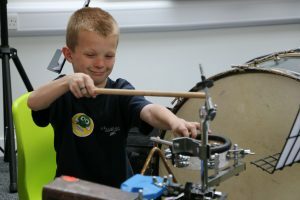 Rehearsals provide concentrated periods of musical learning, develop ensemble skills, involve parents and support staff and impact on social development in several unique ways, providing a bridge to further music ensembles and secondary school. YPCF Sinfonias help children achieve musical excellence, participate in wider social change, and experience structured and creative learning together and individually. STS logo was designed by Grange Calveley, the creator of Roobarb and Custard which features on t-shirts worn by all participating STS children. A special thank you to Grange Calveley who lives in Bathurst near Sydney, Australia. 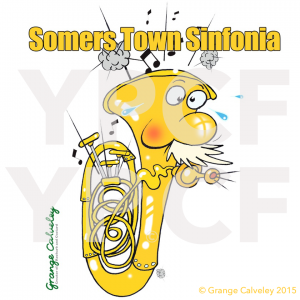 Tuba is a new creation for the YPCF Sinfonia project. 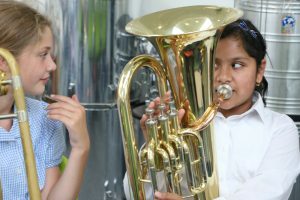 The final Sinfonia concerts include more YPCF musicians, the tutors who work with children throughout 11 weeks and 40 children to create a full orchestra. The invited concert is in Regent High Theatre, and Haverstock School Theatre with parents and staff, to provide a fantastic ending to this YPCF project. YPCF invites funders to help extend the work of the Sinfonias into the future.